Hoist UK have been assessed and registered against the provisions of BS EN ISO 9001: 2008 in relation to the highest quality manufacturing systems and procedures for the design, manufacture, supply, installation, servicing and testing of industrial, entertainment and educational lifting equipment. 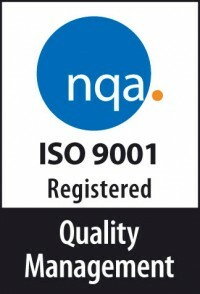 The certification was achieved from months of hard work by the Hoist UK staff to update and improve their quality management system with external auditing provided by NQA, who are a UKAS accredited certification body, ensuring that their systems operate to the very highest standard and fully meets the requirements of the standard. Hoist UK director, Paul Jordan comments: "A good working relationship with our customers and keeping control of the quality of our products are vital in maintaining our success, and also gives our customers real value for money through continuous improvements to our products and business procedures. I'm very happy with all of the improvements we've made, and without the hard work and cooperation of our staff this wouldn’t have been possible." Hoist UK are committed to quality and continuous improvement of their products and services, and are now working towards ISO14001 certification which is anticipated in the first quarter of 2014.